This is the first time that a candidate from the revolutionary, anti-capitalist left won a senior position in the country’s oldest student federation at its most important university. 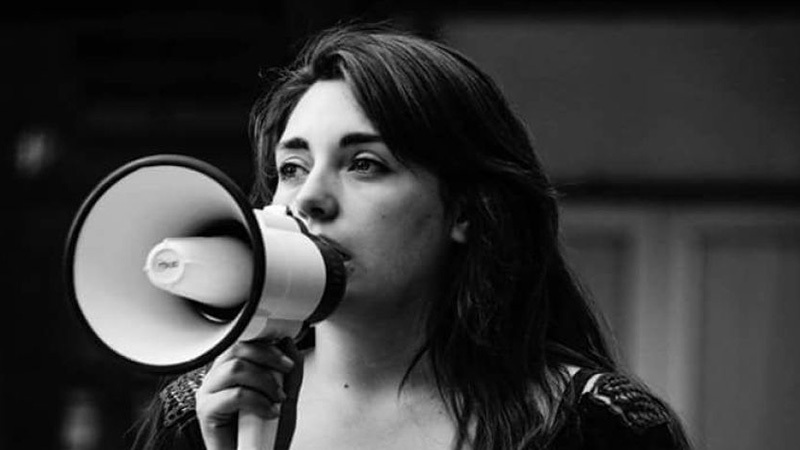 In a surprise victory, well-known feminist activist, student leader and Trotskyist militant Bárbara Brito won the Vice-President position at the Federación de Estudiantes de la Universidad de Chile (FECh – University of Chile Student Federation). This is the first time that a candidate from the revolutionary, anti-capitalist left won a senior position in the country’s oldest student federation at its most important university. The List F “Unidas para Vencer” (United for Victory) ticket that Bárbara was a part of also made history by running an all-female slate for all five executive positions on the FECh. This year’s FECh elections took place on November 7 and 8 and saw seven different lists, including five from the left, competing against each other. With just over 40 percent of eligible students voting and 10,749 votes being cast, the five tickets from the left secured one executive position each on the FECh, thus shutting out the two right-wing tickets from all of the leadership spots up for grabs. First place went to List B, “A pulso, transformemos la Chile” (Let’s struggle to transform Chile). This coalition of former Communist Party members and other leftists, libertarian groups and the MIR (Movement of the Revolutionary Left) won 2,958 votes and thereby gained the FECh Presidency [further details of all the left lists can be found below]. In what came as a surprise to many, the second placed ticket with 2,089 votes was List F “Unidas para Vencer” (United for Victory), a coalition of Trotskyists and Libertarian Communists. The second place for List F means that Bárbara Brito will now assume the Vice-President’s position on the FECh executive. 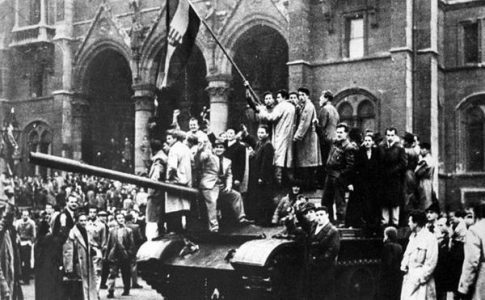 Bárbara’s victory was not only a blow to Young Communists (JJ. CC.) candidate Matilde Méndez, but also something of a political statement in itself, both in terms of Bárbara’s leading role in the women’s movement and on questions of gender and sexuality, as well as her Trotskyist militancy in the Partido de Trabajadores Revolucionarios (PTR – Revolutionary Workers’ Party). The intense, militant campaign of the compañeras and compañeros of the “Unidas para Vencer” team also saw it obtain six councilor positions in six different university faculties. Third place with 1,777 votes went to List E “Crear, una FECH para volver a creer” (Creating a FECH to believe in again), a ticket aligned to the centre-left Nueva Mayoría (New Majority) government of Michelle Bachelet. This saw JJ. CC. member Matilda Méndez take the student union’s General Secretary position. Further back was the Guevarist List A “Vamos Construyendo, La alternativa revolucionaria es necesaria” (Building a revolutionary alternative is necessary) with 1,087 votes, which gave them the Communications Secretary spot. Relegated to fifth position with 1,065 votes was List C “Izquierda en Movimiento” (Left on the move), which is linked to the Autonomous Left (IA) group. Lists aligned with the Autonomous Left have repeatedly held the Presidency since 2011, but IA split earlier in the year with many former members going over to List B. “Izquierda en Movimiento” just managed to win the Executive Secretary position on the FECh. Bárbara’s win as part of the “Unidas para Vencer” list is the first time that a candidate from the revolutionary, anti-capitalist and feminist left has won such an important position in the FECh. Her victory means that the Vice-President’s position can now be used to further promote organization and mobilization, and well as become a national political voice that acts in the interests of a new independent alternative for the workers, women and youth. On the day of the election results, Bárbara was accompanied by around 150 women, student and working class supporters to the offices of the FECh. She gave a speech outside in which she raised the importance of “uniting the historic struggle of the student movement with that of the workers now fighting for NO+AFP [No More AFP – the private pension funds that administer individual retirement savings], as well as determinedly taking the fight for women’s liberation and the struggle for sexual diversity into our hands, with a FECh that takes a leading role in the great social strength of the women, the workers and the youth in order to win our demands”. Bárbara ended by saying: “today we have a massive task and many challenges ahead of us. Only independent mobilization and organization will allow us to win our demands. We are fighting to bring the legacy of the dictatorship to an end, a task that we will only win with the strength of the workers, the women and the students”. Brito spoke on the challenges of the student movement, education reform and the need for students to unite with social movements such as No + AFP and Ni Una Menos at the first official press conference of the new FECh leadership on November 9. Brito declared that she represents “a political force that is here to stay in the Federation and the student movement, one that is here to stay in the women’s movement as well as that of the workers. The force that we represent is that of all the women who in the last few years have taken part in the struggle against misogynist violence, for Ni Una Menos [‘Not one More’ death due to gender violence]. The student movement must take up these struggles, not just as an add-on, but as something integral”. Regarding the challenges faced by the student movement, the newly elected FECh Vice-President said that “the Federation also needs to take into its hands the active organization of the great mobilizations that are now developing. The task for our Federation must be the deepening of the struggles that are taking place among the women, the workers and the students, that is, our contribution must be to organize ourselves together with these movements, for example, together with the No + AFP coordinating committee”. This year’s FECh elections and Bárbara Brito’s victory were widely reported in the Chilean media. Media outlets such as El Ciudadano, La Segunda, La Tercera, El Desconcierto have all reported on the young Trotskyist who managed to beat the young Communist out of the FECh’s Vice-Presidency position. 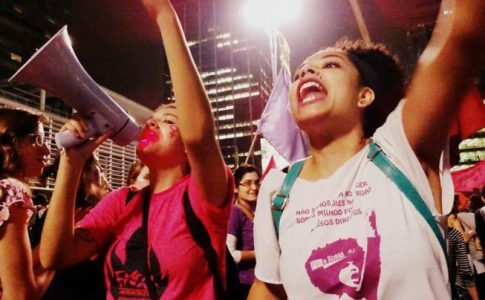 Twenty-six year old Bárbara Brito, an Arts student who also studied Philosophy, is a recognized feminist militant in the Pan y Rosas Teresa Flores (Bread and Roses Teresa Flores) group. This organization, named after early 20th century working-class feminist and communist Teresa Flores, is active in various cities across Chile. Pan y Rosas Teresa Flores brings together hundreds of working women and female students that fight for women’s rights at work and in education, campaigns in opposition to violence against women and for an end to the exploitation and patriarchal oppression suffered by millions of working women. 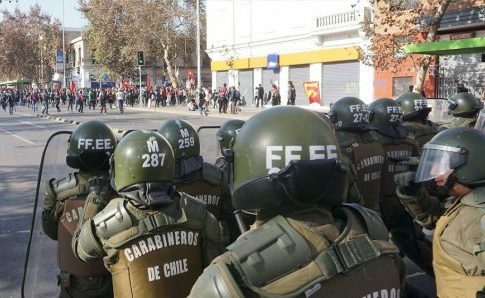 Bárbara became one of the most well-known activists during the massive student demonstrations that rocked Chile in 2011. Starting out in the Faculty of Philosophy and Humanities, she carved out a role as a student leader in the struggle against the market-driven education system and for free public education, as well as fighting along with workers in struggle, all the while campaigning to place no confidence in the governments, parties and institutions of the current regime. After 2011 she was a driving force behind the secretariats and committees for gender and sexuality at the University of Chile, was one of the most visible faces in the struggle against sexual harassment the university, and was a spokesperson for the Coordinadora Feministas en Lucha (Coordinating Committee of Feminists in Struggle) and leading figure in the recently formed Coordinadora Ni Una Menos. In 2014 the Chilean media recognized her as among the top ten student leaders in the country. In July of this year, she was at the head of the Primer Encuentro Nacional de Mujeres y diversidad sexual (First National Meeting for Women and Sexual Diversity), which gathered together around 500 women workers and youth to discuss their organization, their struggles and their demands. Bárbara is also a leader of the Partido de Trabajadores Revolucionarios (PTR – Revolutionary Workers’ Party), an organization that fights “for a workers’ government to bring the legacy of the dictatorship to an end and for socialism”. The PTR is part of the La Izquierda Diario network, the international network of socialist news websites that now spans eleven countries and five languages. 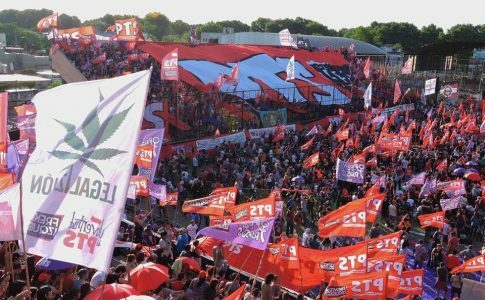 National Student Union (UNE), which is currently led by New Democracy (ND), a group formed by ex-Communist Party members; Autonomist Movement (MA); Libertarian Left (IL); Left Convergence (CI); Movement of the Revolutionary Left (MIR); Manos a la Obra (Let’s Act Now) and independents. Student group “Vencer” and the women’s group “Pan y Rosas” (both linked to the Revolutionary Workers’ Party (PTR)); “Juventud en lucha” (Youth in Struggle – linked to Communist Left (IC – the Chilean section of the LIT(CI)); Gesta Libertaria (Libertarian Action) and independents. Ticket linked to the center-left Nueva Mayoría (New Majority) governing coalition, consisting of the Young Communists (JJ. CC. ); Socialist Youth (JS) and Citizen’s Left (IC). Linked to the Guevarist Youth of Chile (JGC). Autonomous Left (IA), a group which has presided over the last two FECh executives. IA suffered a split earlier in the year, with former members forming Autonomist Movement (MA) which is linked to former student and IA leader and current parliamentarian Gabriel Boric.